Getting into the habit of writing ideas down can be helpful in so many ways. Ideas crave company. Creative thinking can't be used up, and the more you can get comfortable with allowing ideas to come and go, the more you'll have. If you allow all your ideas to take up a little space by getting them written down, you also release yourself from judging them, loosening up that creative muscle. This is excellent for letting the really good, juicy ideas to the front, meaning the quality of your ideas will go up! It's very common for a big influx of unrelated ideas to rush in just when you're in the middle of another project. This shiny-idea-syndrome, or magpie effect is to blame for the many unfinished and half started projects creatives tend to have on the go at once. The problem is that your mind is getting comfortable and cosy with the current project, and feels like it's done all it's work on the creative problem solving front. It just wants a new challenge! 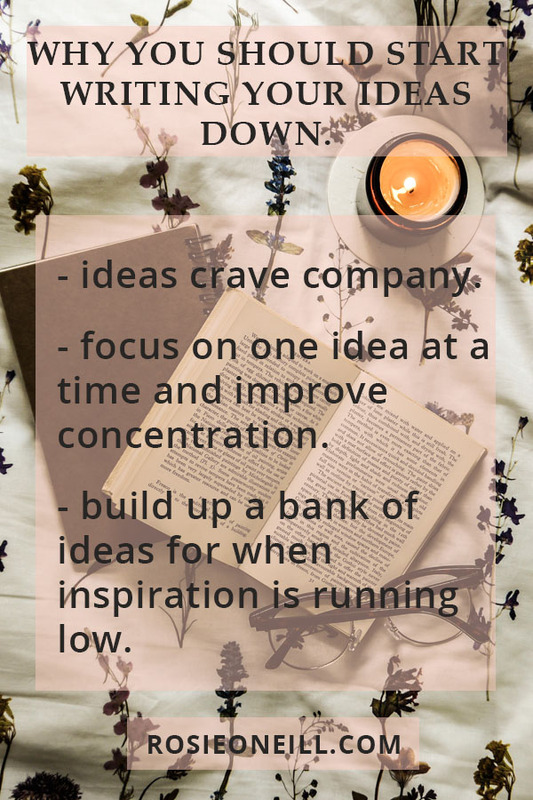 Writing the ideas down and putting them to one side stops you from starting up with the new project right away, and allows you to finish your existing project with improved focus and concentration. Building up a big list of potential ideas is one of the best ways to beat creative block. The next time you're feeling stuck or lacking in inspiration, simply browse through your collection of notes and ideas and allow your creative spark to be reignited. And if you need a little more encouragement to get your ideas written down? I made something just for you! Sign up to receive the Studio Notes emails and I'll send you a mini ideas journal to download and make.